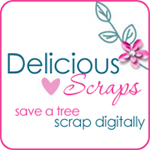 Delicious Scraps: Another Gorgeous Layout!! This beautiful layout was made by Beverly! So adorable! Click on the image to check out her blog! Click on the images below to get the kit "Chocolate Mint" - it's ON SALE right now! gorgeous kit as always!! i left you a surprise on my blog! !